There is a friend for every season and every reason, but true friendships change your life. A 20-year friendship between two chimpanzees, Jayson and Nikita, at the Lucknow Zoo in India was in the news recently. The zoo was planning to separate them because they weren't reproducing. Indeed, these two were simply the best of friends. Fortunately for Jayson and Nikita, protests by the public and scientists halted this ill-conceived plan. For me, this brought up interesting questions about how friendships might be adaptive, influence your life and success, and how different degrees of friendship can be helpful or harmful to our well-being. In humans, we know that having strong social bond reduces stress and lowers the risk of disease and the same is true for animals. Social network analysis, which looks at how connected individuals are with one another is revealing that all kinds of animals have buddies and, like us, some individuals are tremendously popular. I like to think of social network analysis as Facebook for animals, except it's grounded in real-world interactions. A recent study of vervet monkeys revealed that those with more social ties, or friends, were able to stay warmer on chilly nights, presumably because they could huddle together with more friends. And it's not just primates. In wild horses, social network analysis revealed that females with more friends experienced less harassment by males, higher birth rates, and greater survival when compared with females that had fewer pals. This means that friendship can have immediate benefits that over time may increase your survival and success. Making friends is always tricky and can depend largely on your motivations. Sometimes you need strategic friends because as we know all too well, it's not what you know, but whom you know that matters. This is also true for baboons, where similarity in age and social status plays a role in who becomes your "friend." That's because, if a friend is going to have your back in a conflict, it's most likely to be a high-ranking friend. If you are a hyena trying to join a new social group, you have to be very careful whom you choose as a friend. If you don't have any friends yet and you're looking to make one, the proper hyena etiquette is to always take the side of the highest-ranking hyena in any conflict, even if they are losing at that very moment. Having friends that aren't sincere relationships can go beyond simply strategic alliances, which usually work for both parties, and into the realm of frenemies. This type of relationship does not reflect genuine affection, but rather is a way of keeping an eye on the competition or using someone to get ahead for your own purposes (often to their detriment). We see frenemies in chimpanzees. 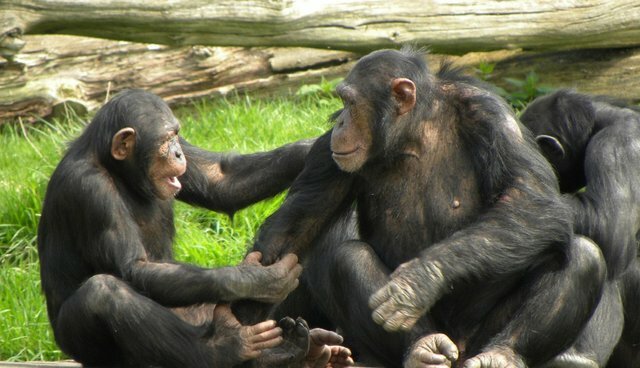 Because status is so important in chimpanzee society some individuals align themselves with whoever is most dominant, but, unlike in hyenas where the hierarchy is stable, things are often in flux with chimpanzee and some individuals will readily switch allegiance and support the opposition if they see that their current "friend" is losing his position. Just as for chimpanzees, it can be critical for us to be able to detect such imposters. How can we tell the difference? The same way we know what kind of friend we are being. Lasting friendships are built on repeated actions that foster cooperation and support. These behaviors generate memories and emotions. Over time, we find, that true friends are a witness to our and also become deeply embedded into the experiences we have along the way. In a very real way, our friendships may just affect our DNA. A study on African grey parrots provides some interesting insights. Telomeres, which are bits of DNA at the end of chromosomes that control the stability of chromosomes and DNA, get shorter with time, which results in more DNA damage and aging. Researchers found that the rate at which telomeres shorten in Africa grey parrots was influenced by whether or not an individual parrot was socially isolated. Essentially, a parrot kept alone aged faster and had shorter telomeres than another parrot his or her same age. In the end then, not only does having a solid network of friends reduce stress and lower disease, but it will also increase your lifespan. For more discussion, check out "Science News You Can Use Radio" with Amy Alkon and Dr. Jennifer Verdolin: "How Friendships Can Enhance Who You Are and How You Live."